We had three ride visitors during 2007 which added to the riding fun of last year. Tricia is an ex-New Yorker currently living in California. Tricia spent her high school years living in Verona so she likes to come back to visit, staying for a few months or a few weeks. It was quite by chance that we first met in 2006. She eventually joined Gruppo 1 and went on the 2006 Corsica Tour. She came back in 2007 and stayed for the Puglia Tour. She also had the good timing to be here for the Giro d'Italia TT stage from Bardolino to Verona which was commemorated with a maglia rosa (pink jersey) ride on the same course. Brent was put in touch with me through a friend of a friend of a friend. He lives in Florida and has the good fortune of having to travel to Italy for IT contract work. He brings along his beautiful Hampsten S&S Ti bike and is ready to ride about an hour after arriving in Verona. We've had a lot of good rides and dinners. David is from the Chicago area. We first met in 2006 when he first visited Verona (with no bike). He promised to bring his bike the "next time" which he did in 2007. It was the first time David did any climbing on his bike but by the end of his visit he was right at home on the climbs, including a memorable trip to a glacial lake northwest of Lake Garda. I am fortunate that the Gruppo 1 club is very open minded and warmly receives the visitors I bring to the club rides. Believe me, it's a completely different experience than coming over on a tour. There are a few places that have river rock and there is usually a strip to ride your bike. The strip can be a granite or marble. Riding on wet marble is like riding on ice. Finally, a BEAUTIFUL Day! When I peered out a the window at 7:00 a.m. the sunrise was beginning to light up the sky and you could tell it was going to be a wonderfully clear day. I departed home early at 8:30 a.m. so I could make a couple of stops before the club ride start at 9:30 a.m. The first stop was at Caffe Tubino for a quick espresso to get my engine jump started and warmed up, it was 3C. Caffe Tubino is generally acknowledged as having the best coffee, and friendliest owners, in Verona . The second stop was at bike shop near where our rides start from. At the ride start I learned that most of the Wednesday regulars had decided to go skiing (lots of snow only 1 hour north of Verona). So it was Antonio Paolo, Petra and I. We started fairly briskly but about 10km out were joined by two strongmen from Petra's racing team. After that there was little time to enjoy the scenery as the paced picked up quickly. We wound our way to Bardolino, Garda, and Torre del Bennaco. We did the Torre climb and descended back to Garda and stopped for an espresso at Bardolino. As we left Bardolino we peeked into Paola Pezzo's shop to see the latest products from Bianchi, Scott, and Specialized. 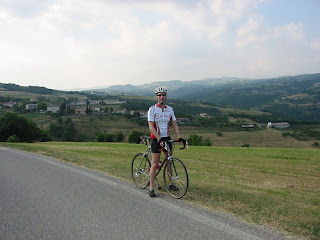 We climbed out of Bardolino and wound our way back to Verona on a stradina (small road) which is virtually deserted all the way to the city's limit. Max HR 235; this has to be someone else's! but my Polar is supposed to be coded between the watch and the transmitter. I think I'll have to mount it on my handle bar so I can see what's happening as I never really felt stressed to day. 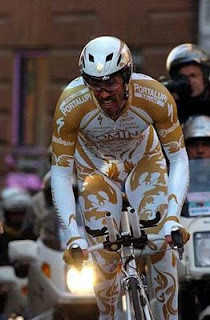 Mario Cipollini has signed a contract with the USA Michael Ball's Rock Racing team. 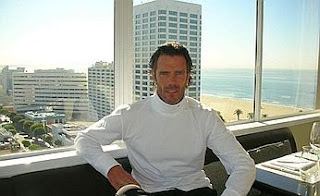 Mario has been in Santa Monica, CA (above), negotiating the contract which will be for 5 years. 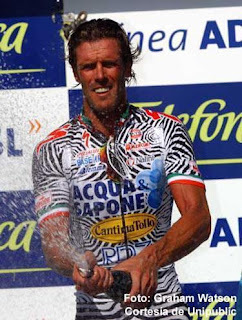 The Gazzetta dello Sport in reporting the contract signing also reported that Cipollini will also be racing in the Tour of California next month. The only bright sunny day, in seemingly forever, was Friday. We had invited two couples from Gruppo 1 for dinner so I was busy shopping for the ingredients, food preparations and cooking, all with the help of Ms. E. For a change of pace dinner was going to be paella. No riding in the cards for me. The paella came out great (seen here simmering about 25 minutes before it was ready). We had a nice wine to go along with it, a "Ponte Pietra" based on merlot and corvina grapes. It's produced in the nearby small town of Monteforte d' Alpone by a neighbor's sister. For dessert we had a "torta di mele" (apple cake) prepared by Daniela. We dined and wined late into the early morning. L-R: Juliana, Attilio (he really liked the green tabasco sauce from the USA), Daniela, Beppe, and me. Getting up early Saturday morning wasn't easy. 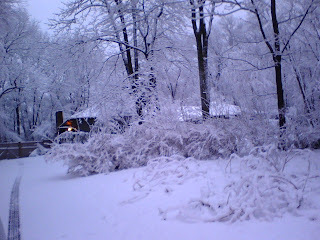 Especially, looking out the window and seeing that we were back to cloud cover and fog. It's odd that sometimes when you think you are going to suffer on a ride you actually put in a good ride. Which was the case this moring when "Dodi" took the lead at the front and just turned a big gear and motored all the way to Lake Garda. 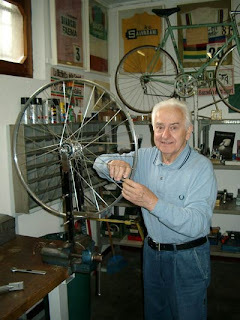 Pietro Piazzalunga, the man you would love to have wrench your bike. Retired? 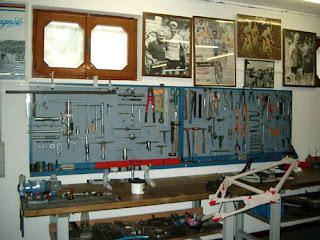 The great ones like Gimondi still insist that Pietro work on their bikes. 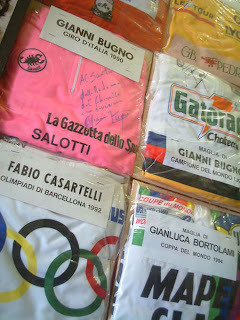 Note the signed jerseys and other memorabilia that grateful champions have given to the master mechanic. 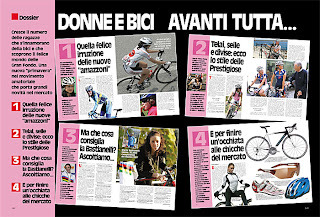 The following article appeared in http://www.bikeraceinfo.com/ by Bill McGann and Valeria Paoletti. In compiling our oral history of post-war professional cycling we wanted to add the memories of a great mechanic. These men are an essential but little-noticed part of any great team. 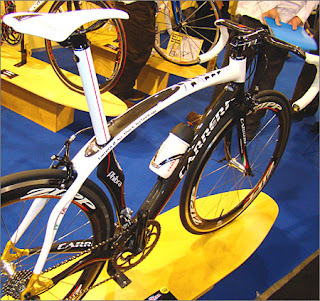 A dropped chain because of a poorly adjusted front derailleur (as happened to Marco Pantani in the middle of an important Tour climb) or a broken chain (Julio Perez-Cuapio was so victimized in the Giro during a solo breakaway) and the athlete's best efforts and the unbelievably large expenditures of the team can be for naught. A quick and skillful wheel change can get a rider back into the race with little effort so that he can save his energy for racing instead of chasing the peloton. Pietro Piazzalunga is a very kind and modest man. He possesses a temperament that that Italians call "dolcezza". This word doesn't translate well into English. It conveys a sense of considerate kindness and sweetness without meaning effeminate. As you read this interview you will see that he has a kind word to say about everyone and everything. That's just his way. 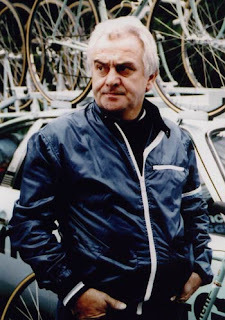 He is so self-effacing that in meeting him for the first time one would not think that he was one of the finest mechanics in the history of cycling. His incredible career spanned from 1960 to 2003. He worked with some of the greatest teams and champions of each era, winning five Giri d'Italia, one Tour de France, one Vuelta d'Espana and nine World Championships. His expertise was so sought by the riders and the managers that he would be still working today for the most important teams if health problems had not sidelined him in 2003. Signor Pietro lives with his wife in a cozy house in Bergamo, just east of Milan in Northern Italy. His work garage used to be crammed with frames and wheels ready for the races. 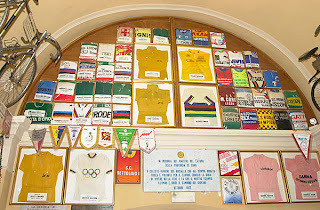 Now it is a little museum with winning bikes and jerseys that his old friends have given him as a sign of their gratitude. 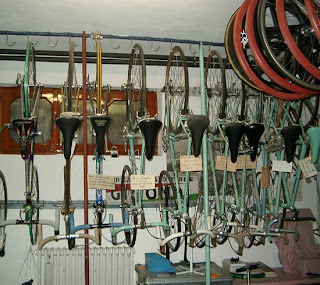 Many of them (just to mention two, Felice Gimondi and Franco Ballerini) still ask him to personally take care of their bikes. Question: You worked with the some of the greatest athletes on some of the greatest teams in the history of the sport. What is your fondest memory? Pietro Piazzalunga: I have always been so lucky. I got to work for the big teams such as Salvarani and Bianchi-Campagnolo and for great riders: Felice Gimondi, Gianni Motta, Walter Godefroot, Antoine Houbrechts, Guido Reybrouck. Gimondi's victory in the 1974 Milan-San Remo is one of my fondest, but all my career brings me very gratifying memories. Another busy day at the office. 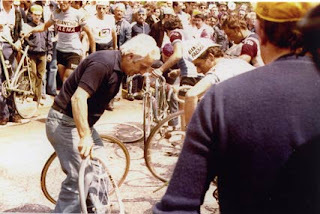 Pietro repairs Felice Gimondi's bike after a mass pile-up. Q: From an emotional point of view, not from a functional aspect, what era's bikes do you like the best? PP: It not the era itself. Working with my National Team gave me a unique feeling. All the victories at the World Championships were just beautiful. Q: Is it because of the different spirit you felt during the races with National Teams? PP: Right. There was a different atmosphere. I also liked the incredible fights between Gimondi and Bitossi during the Italian Championships. Q: Describe a day in the life of a mechanic in a Grand Tour back then in the sixties. What time did you get up? What did you have to do to the bikes in the morning? PP: I started working at 5:30-6:00 a.m. The bikes were prepared for the day's races the night before. I again checked all the bikes and loaded them on the cars. All the work was done in the evenings. I didn't have dinner until I was done with all the bikes. When I finally had dinner the riders were almost ready to go to bed, around 10 p.m.
Q: So you got just a few hours sleep before the next morning's work? : Walk us through your duties in the afternoons after each race. What did you do to each bike to prepare it for the next day? PP: Usually there were two of us, both mechanics. My partner washed the bikes and I checked them carefully, fixing or changing parts if necessary. Q: What did you do with items that aren't perfect enough, like tires with small cuts? PP: I changed them. I changed everything that was not perfect. There was a lot to do, especially after a crash. During the World Championships there would be three mechanics. One washed the bikes, one washed the wheels and I checked and fixed everything on the bikes. I was responsible for the final check of each bike. Q: What was your job during the stage races? Did you also prepare food and the feed bags? PP: No, that was a duty of the masseurs. I followed the riders in a car and helped them if something happened. Q: Was a wheel change during a crucial stage in the sixties a moment of tension? Was it so easy and quick like today? Did you practice wheel changes to be ready for a flat or was this something that you did so often that it came naturally with years of working on bikes? PP: No I didn't practice for that, I was reasonably fast from my years as a mechanic. I have been always lucky, however. Things never got complicated on me during a stage. Of course the cooperation of the rider during a wheel change was also important. Q: You are making all this seem so easy and smooth. It must be because you were always on top of things in your work. I guess the staff of mechanics on such teams is as top-notch as the riders. PP: Well, it was also because the teams I worked for were always well-organized. Q: How does a nice Italian boy end up being a professional mechanic? PP: I had a great passion for this world. I started assembling bikes at the Chiorda factory. Q: And how did you start working for those big teams? PP: While I worked for Chiorda we built a bike model named after Fiorenzo Magni [among other things, former Yellow Jersey and Italian national team manager]. Then, in 1960, I started working as a professional in the Team Philco, whose manager was Giorgio Albani [legendary manager of Molteni]. After moving to Salvarani in 1963, I was called by Fiorenzo Magni to work for the Italian Team in the 1965 World Championships. I had met Magni some time before during the race "Le Tre Valli Varesine". Magni told me that they were choosing the mechanics for the World Championships. "We are selecting our mechanics and you are one of our favorites", he told me. Q: Both the managers and the riders trusted you very much. PP: The riders awarded me a prize for being the best mechanic, 'La Pinza d'Oro' [literally 'The Golden Tong']. I must say that my friendship with Felice [Gimondi] helped my career. Q: Let's look into your 1965 more deeply. That year you won both the Giro and the Tour with Vittorio Adorni and Felice Gimondi, respectively. And Gimondi did very well even in the Giro coming in third. So you had two good men at the top of the GC during the Giro. You were the one who prepared and double-checked their bikes, so you had a great responsibility. Did this change your attitude or your work? PP: When you have two men like them on your team, your responsibility doubles! I was always filled with anxiety during the races, from the beginning of each stage. I barely ate my lunch. Q: So you did feel the responsibility. Did you ever make a mistake in setting up a bike that caused problems for a racer? PP: That was my biggest fear. Those things can always happen you know. I was especially worried during the World Championships. But thanks to God, apart from flats and crashes that you can't predict, nothing serious ever happened. Q: How did a bike for a big mountain stage differ from a bike for a flat stage in the '60s? PP: The frame was the same, the gears were different. In the mountains we used 42 or 41 for the small ring in front with a 25 or 26 for the big cog in the back. For time trials we would use a 53 or 54 big ring with a 45 small ring. The rear cluster would be a 13-18 block. At the end of each stage the manager came to me and told me what to mount on the different bikes, depending on the stage and what each rider preferred. Q: What tire pressure did you use? Q: You didn't change the pressure depending on the type of stage, did you? PP: No, besides the weather it depended more on the rider's preference. I had all the tires ready in the morning. Then the riders came in to check their bikes and asked me if everything was fine. We again checked the pressure, this time together. Q: What did you do with the tires used the day before and that were not perfect anymore? Did you save them for training? PP: No, we didn't. All the teams I worked for were big. Some of my colleagues working for smaller teams came to my house to see how much stuff I had in my working garage. When I worked for Bianchi, in order to be constantly prepared, I had 260 pairs of wheels ready. Q: Today a time trial bike is a very special, unique device. Did you do anything different to the bikes for a crono? PP: We used lighter frames, but not everyone in the team had a lighter bike for the time trials. I remember only Gimondi, the Dane Tommy Prim and Knut Knudsen had special, lighter bikes. Q: When did teams start having special crono bikes? 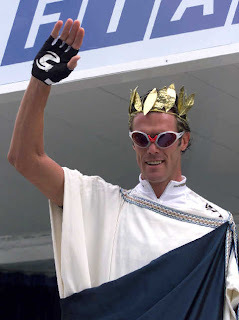 PP: Things started to get different the year that Fignon won the Giro, 1989. 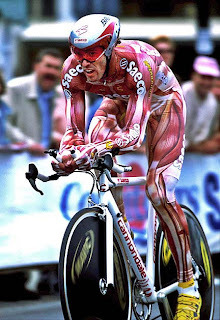 I remember that year Moser used lenticular wheels during the time trial of the Giro. After that they became very popular. Q: This made for a lot more work for you? PP: For sure. That meant at least another bike to assemble and prepare for each rider. I worked on 15 crono bikes for each team. Q: Besides the different frame, what were the other differences in the equipment and preparation of a TT bike with compared to a normal bike? Faliero Masi told us of mechanics who would boil the ball bearings in oil.PP: We used lighter tubulars with a higher pressure and lighter rims. I never boiled the ball bearings in oil. Q: What tire pressure was then used during a time trial? PP: We used 9 atmospheres in the rear tires, even 9.5 if the stage was on a good road, and 8 in the front tires. If the weather were bad we used the same pressure we used in a normal road stage. Q: Let's look at a 1965 bike piece by piece. Did you get the frames from the builder and assemble the complete bikes? PP: Correct, I gave the framebuilder the sizes to build each frame. When I got the frames I had to mount all the components in order to assemble the bikes. Q: From the mechanic's point of view how were things different when a bike company like Bianchi was the sponsor compared to when a framebuilder was the supplier? PP: When I worked for Bianchi I helped even with the frame building. I went to the Bianchi Factory after the end of the season to take care of the frames for the new season. I worked together with the framebuilders and we built 3 frames for each rider. Two of them were assembled into bikes right way. The third frame was ready to be assembled if necessary. Q: So the frames were all custom-built to the measurements of each rider? Q: Did you build more frames during the season? PP: I was the only one who always built new frames for the World Championships. I brought three bikes for each rider there. The second bike was on the car following the riders and the third one was at the mechanics station. Q: How about the wheels? Did you have to build all the wheels? Q: What kind of tubing were the frames made from? This was before Columbus SL, correct? PP: The tubing we used was from Columbus. 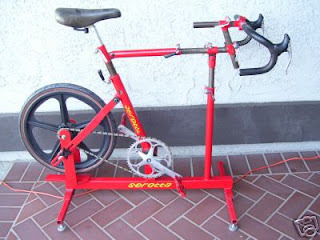 I used rather rigid tubing, especially for Felice [Gimondi]. I needed to make the bike flex as little as possible during a sprint. Felice also wanted a different type of fork. He preferred that his forks be built with flat fork crowns rather than the newer sloping style. Q: Were frame failures a problem then? Did you have to be vigilant and keep an eye on the frames to make sure nothing broke? PP: That depended on the skills of the framebuilders and welders. 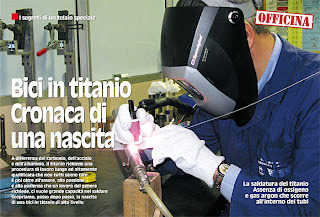 When I was in Bianchi I asked them to build a special glassed-in room for the welders to keep out any breezes. It was important not to have cold air drafts during the welding, otherwise the joint would cool too quickly and lose strength. Q: Did you ever have a broken frame? Q: The bikes were equipped Campagnolo, with Universal brakes? PP: At the beginning the brakes were Universal, then later everything was Campagnolo. Q: Details about the components. Let's start with the wheels. Campagnolo 5-speed Record hubs, low flange? PP: Yes, only the sprinter Marino Basso preferred high-flange hubs. Q: What kind of spokes? What brand? Q: 1.8 or 2.0mm ? PP: 1.8 in the front wheel and 2 mm the rear wheel. Depending upon the strength and the weight of the rider we would use 32 and 36 spoke wheels. Sometimes even 28s. Q: Were breaking spokes a problem? Q: Rims? Heavy and strong? PP: Strong. Lighter rims only for the time trials. In the 60's we used Nisi and Fiamme. Later we used Ambrosio and Mavic rims. Q: Tires, tubulars of course. What brand, model and weight? PP: Yes, tubulars, Clement, weighing 250 or 260 grams. We used the 250's for good roads and the 260's for rough or dirt roads. For time trials we would use Clement Campionissimo Seta [silk] or Continentals weighing 220 grams. I would set up Gimondi's bike for the 6-Day races with the Continentals. I mounted the light Clement silk tires for him for Milano-San Remo. Q: How long did a tire last when raced by a pro rider? Q: You had to glue the tires on the rims. Tell us, step by step, how you affixed the tires to the wheels? PP: It was a long process. First I built the wheel. Then I filed the rim (the part of the rim where the tubular would sit) a little bit to remove the oxide from the surface of the rim. Then I put the mastic [a natural resin] - the base layer - and I waited 2 for days. Then I put another layer of mastic and waited 4-5 days. Then I finally glued the tubular using both some glue and a little mastic (directly on the tubular). Q: So you needed about 7 weeks to prepare every wheel! PP: Yes, that's why I had so many wheels ready in my garage. Q: What brand of glue did you use or did you make your own? PP: I bought it. The brand was Clement. Q: Did you age the tires or use them directly from the factory? PP: We used new tires. Q: Did you have a big box of cogs to set up the gears to set up the bikes for each day? PP: Yes, we had a case with different cogs depending on the kind of stage. PP: At the beginning they were 4, then 5, then more... .
Q: Did you have to work on them and prepare them? PP: No, we got them ready to ride. We got different types depending on the preference of the rider. Q: Crankset. Campagnolo Aluminum? 42-52? Q: Bar and stem. Now riders use 42cm center to center. Back then it was usually 40? What brand ? PP: Yes. We used Cinelli. The width depended on the rider. It could be 40, 41 or 42cm. Q: Your career was long and you saw the profound changes to the bicycle, from a steel 10-speed to an aluminum, super lightweight 20-speed. Did these changes make your job easier? PP: Oh yes, they did! Especially when all the innovations related to Shimano arrived. Q: How did your life as a mechanic at a Grand Tour change through the decades, from the early 1960's to the end of the 90's? PP: In the sixties there weren't the nice big trucks that teams have today to transport their inventory. I remember that to do that I used a little FIAT van. I had to stuff it with so much equipment that I could barely fit in the van! Q: So things got easier and easier for you over the years with the infusion of money in the sport. How did your work differ between working an important one-day race like Milano-San Remo and a stage race? PP: The real work for me was in the stage races. Q: Tell us about the Championships of 1992 at Benidorm, Spain. 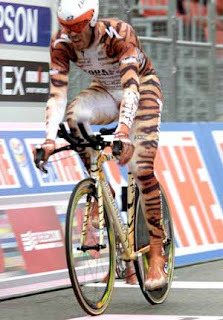 Gianni Bugno won for the second year in a row. Alfredo Martini was the director of the team. PP: That was magic. After that I decided to stop working the World Championships. PP: I could not desire more than that. I had taken part in 27 World Championships and won nine. Q: How did you set up the team's bikes in those years (early '90s)? Clinchers or tubulars? PP: I used always tubulars. They are better for the riders (though not for the mechanics). Q: Did you set up a world championship bike to be rugged and strong or did you take chances and make it lightweight? PP: I used the same bikes that the riders used during the other races of the season. PP: I can't tell you who was the best. They are all great persons and were all great managers. Q: Whenever we talk to racers, we ask them which race they loved the most and which one they hated. Which one did you look forward to? PP: Maybe it seems impossible but I was always happy wherever I went. I enjoyed even the cold and wet Northern Classics. When Moreno Argentin won the Fleche Wallone in 1990, it was my 60th birthday and he wanted to dedicate it to me. Q: You relationship with the racers was good? PP: Some of them preferred staying at my place than going to a hotel after the end of the Giro, so I had Fred De Bruyne [legendary Belgian classics rider and race commentator] at my place for one month! Q: Was your job well paid? PP: Yes, it allowed my family and me to live well and gave me the possibility of travelling constantly. I consider myself very lucky to have had such a life. Q: Do you miss that life? PP: Yes I do and I would be still working now if I had not had a problem with a vaccination for the flu two years ago. I had an allergic reaction and went into coma for one month. Then I had to go through a rehabilitation. Q: Do you follow racing or the development of cycling technology today? Do you stay in touch with your old friends in racing? PP: When I see the races on TV I suffer. I would like to be there. When [Michael] Rasmussen had those mechanical problems during the last time trial of the 2005 Tour I knew what the problem was and why they could not solve it right away. I go to see all the races I can, like the Giro stages in my area or the start of the Milan-San Remo. I meet my old friends and colleagues there. It's nice to see that even foreigners who are old friends like Walter Godefroot, as well as journalists, still stop to greet me and ask how I am. When I was in the hospital many ex-riders like Bitossi, Ballerini and Fabbri came to visit me. 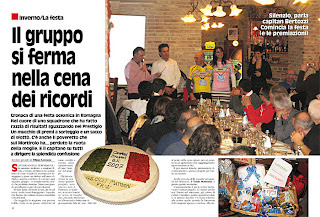 And Gimondi was always close to me. The eyes of Mr. Piazzalunga got a little bright with tears. My recording tape ended but I kept talking with him about his feelings of gratitude for all his old friends. Then he showed me his incredible garage and told me yet more about his work. 'Piero, il pranzo è pronto!' [Piero, lunch is ready], his wife called us. A very nice lunch, entirely cooked with Franco Bitossi Olive Oil! 60-62 Philco, with Bitossi. Managers: Albani.and Magni. 63-72 Salvarani, with Gimondi. Managers: Pezzi, Adorni, Panbianco. 73-77 Bianchi Campagnolo. Managers: Ferretti, Adorni. 78-79: Bianchi Faema. Manager: Ferretti. 80-84 Bianchi Piaggio. Manager: Ferretti. 85-86: Bianchi Sanmontana. Managers: Bortolozzi, De Lillo. 87-89: Gewiss Bianchi. Manager: De Lillo. 94-95: Lampare Panaria. Manager: Pietro Algeri. 96: Panaria Vinavil. Manager: Pietro Algeri. 97: Mapei GB. Manager: Pietro Algeri. 98: Mapei Bricobì. Manager: Algeri. 99: Lampre Daikin. Manager: Algeri. 65-66 with Magni as Coach. 67-72 with Ricci as Coach. 73 with DeFilippis as Coach. 74-92 with Alfredo Martini as Coach. 1968: winner Adorni, in Imola. 1972: winner Basso, in Gap. 1973: winner Gimondi, in Barcellona. 1977: winner Moser, in San Cristobal. 1982: winner Saronni, in Goodwood. 1986: winner Argentin, in Colorado Springs. 1988: winner Fondriest, in Renaix. 1991: winner Bugno, in Stoccarda. 1992: winner Bugno, in Benidorm. Adorni in 65 with Salvarani. Gimondi in 69 with Salvarani. Gimondi in 76 with Bianchi. De Muynck in 78 with Bianchi Faema. Pavel Tonkov in 96 with Panaria. Some of the bikes that riders, after winning great victories, have given to Pietro. The master's immaculate workbench with reminders of a wonderful life mounted on the wall. Want To Know The Weather In Italy? The best website I've found for weather predictions is http://www.meteo.it/. I have found it to be very accurate. Unfortunately, I've been having to use this site much too frequently lately. -the forecast is presented using the 24 hour clock, it will cycle through this automatically or you can select the 6 hour time you are interested for the current day ("OGGI"). The default display is the weather "TEMPO" but you can also select temperature "TEMPERATURA" or sea and wind conditions "MARE E VENTO". -you can also select DOMANI to see the weather for tomorrow; in all you can look at 6 days with the last two being long term predictions. It's been tough to get a ride in but today there was a break in the rain so I went off on still very wet roads. I decided to start extending my mileage so the plan was to continue to focus on "agilita" and visit Torre del Bennaco for some photographs. Even on not-so-nice days there are plenty of riders on the roads. As I enjoy a spirited ride so much I jumped on the wheels of a strong guy and we took turns at the front from Domegliara all the way to Torre del Bennaco. Some short climbs were involved and I was spinning rather furiously in my 39 while the strong guy was churning a 50 or 52. I pulled off in Torre and took a few minutes to take some photos of the small harbor, the very calm lake under an interesting sky, and my Malagnini bike. From Torre I went back, south, along the lake road and stopped at an overlook just before reaching Garda for a few more photos. At this time of the year the lake towns are virtually deserted. There is also a lot of construction taking place, new construction and renovations as everyone prepares for yet another season of the onslaught of tourists. I shouldn't complain about wet roads. Back in NJ, I wouldn't have been riding. It's raining, and dreary. I can't remember the last time we had a stretch of 10 days of bad weather like this. Ever since January 1st it's been quite miserable. It's been warm though, 10C, so as soon as the sun pops out again we should be on the roads again. Madonna del Ghisallo is a hill close to Lake Como. It is named after a legendary Marian apparition. 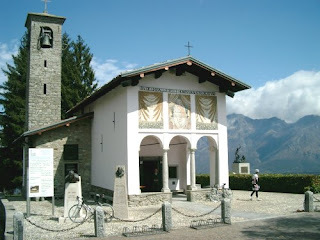 In 1949 a local priest, Father Ermelindo Vigano, proposed to declare Madonna del Ghisallo the patroness of cyclists. This was admitted by Pope Pius XII. The preceeding year, in Rome, the Pope had also lit and blessed the bronze eternal flame that today burns inside the shrine. The chapel is unique to say the least. This famous hill, with its spectacular views, has also been the decisive or conclusive stage of the most renowned races, from the Giro d' Italia to the Giro di Lombardia. It's for these reasons that thousands of cyclists ride up to Ghisallo each year. 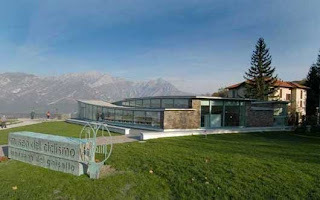 In 2000 the Foundation of the Ghisallo Cycling Museum organized a relay from Madonna del Ghisallo to the Vatican to deliver a torch of the eternal flame to Holy Father John Paul II. This event inspired the idea of creating a cycling museum in a separate structure that could enhance the heritage of the shrine. 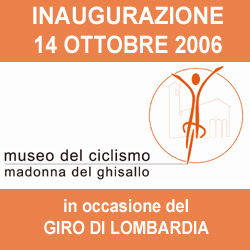 The "Museo del Ciclismo, Madoona del Ghisallo" was inaugurated in 2006. 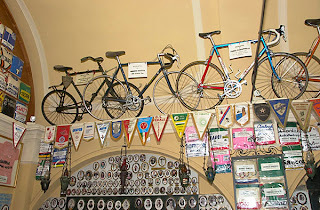 As a museum of cycling, the museum has positioned itself not just of bicycles but also to being devoted to the men and women of the sport, from competitors, journalists, to organizers, etc. "THIS AUCTION IS FOR USED SEROTTA BIKE IN GREAT CONDITION. WHAT SEE IS WHAT YOU WILL KATE. THANK YOU FOR INTERESTED ON THIS VERY NICE BIKE HAVE NICE DAY"
Coupled with the long Italian holiday season, ending January 6th, and a stretch of bad weather the first club ride wasn't until today. At that, the weather was iffy in Verona with heavy early morning fog. With other club members still taking advantage of good skiing conditions to the north the result was that only 5 riders were at the 9:30 a.m. start. Only myself and Paolo had been riding somewhat regularly during the last month while Gianni, Barbara and Ester had taken a one month break, two weeks of which they spent skiing in the Dolomites. The pace to Bardolino was nice and easy and as we approached the lake the fog lifted and we were treated to a sunny day. Stopping for our traditional espressos we caught up on everyone's activities during the holiday. We then headed back to Boscomantico for lunch. The special today was pasta with rabbit meat. In about 3 weeks one of my favorite dishes will be available again, "renga". Renga is a fish dish served with polenta, and it's only made during the period of Carnavale. One of the beautifies of Italy is the diversity of the cuisine and there coupling to traditions; one of the maddening things is that when you like something you might have to wait another year before you can eat it again. Nasty, cold, and wet weather has moved into northern Italy over the last few days, and continues to linger. One of the peculiarities of Italy is that store sales are only permitted two times per year. The dates are established by each region. Today, January 5th, was the start of the sales in the Veneto region so with the miserable weather we shifted from cycling to shopping. It also gave me a chance to get caught up on more of the articles of the latest 244 page issue of CT.
As I have previously mentioned, CT magazine is the most important cycling magazine when it comes to the world of the granfondo. The name CT signifies CICLOTURISMO. That was probably the original focus of the magazine but I am guessing that as granfondos became more popular so did the focus of the magazine. 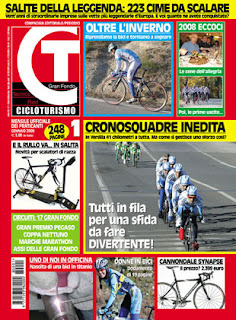 In fact, you can see that they have added the words Gran Fondo under the CT logo. When you go to a newstand in Italy you can expect to find many cycling magazines, all of which are much better than BICYCLING. The highlight of this issue for me is the 10 page photo spread of how Doriano De Rosa (of De Rosa bikes) goes about building a Ti frame. I found it very interesting as there were 28 photos of the entire process. Doriano builds every De Rosa Ti frame. In an exchange of emails with Darren Crisp (see www.crisptitanium.com or search in my blog for Crisp) about the article, he writes, "Doriano is one of the last great framebuilders left and I highly respect his work and experience, as well as attention to detail. We got to chat a bit at EICMA (note: the Milan bike show) when he came to visit my stand, and he's a super-friendly guy. I would love to make it up to his shop as he's the only one left that does actual frame"building" at DeRosa." Typically there are also two full bike tests. 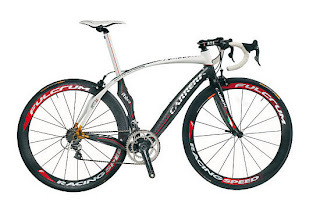 For this month the bikes tested were the Carrera Phibra and the Cannondale Synapse. Worthy of note are the Carrera's unusual design and the fact that it is completely made in Italy. The one page ads are too numerous to mention! I hope this gives you some idea about the contents of a typical CT.
My Friend Writes, "Paddy's Racing Potato"